Steelhead were first reported in angling literature in the late 1800's. Since then there has been a steady stream of books and magazines devoted exclusively to this very special anadromous trophy rainbow trout. However, it has only been in the latter quarter of the 20th century that steelhead have reached their prominent status in angling. This has been the result of many factors including; their successful transplanting to the Great Lakes rivers in the 70's; the successful west coast hatchery programs of the 80's; and, their elevation in angler magazine literature. As a result of the special attention given to this trophy trout by west coast anglers and, now, Great Lakes anglers, specific acts and mannerisms of steelhead are now known and recognized. Truisms are those behavioural actions that occur the greater percentage of the time, behaviour that can be counted upon in most normal situations - remember, normal circumstances. The angler, knowing these behavioural traits, can apply this knowledge when he is on the river to increase his fishing success. Following are a few of these traits which, if the angler follows them, should provide more river action while steelheading. Remember that the summer race of steelhead often exhibits greater activity. This is likely a result of being poikilothermal (cold blooded) and the warmer summer and fall waters make them more energetic. As well, summer steelhead will often strike at lure offerings because their stomach has not yet shrunk when they enter their natal stream. Warm spring rains and river spates often result in the same affect on winter steelhead. Only highly select sections of river pools, troughs and riffles are steelhead holding locations! Steelhead rest and travel in very select locations in rivers until they reach their spawning pools. These locations are determined by light, current flow, and instream structures like ledges, troughs, logs, and large boulders. Steelheaders need to spend time on the river when it is in low flows to learn the structures and troughs which could hold steelhead. To shotgun a pool with casts in all directions is rarely productive. Rather, the angler must learn to 'read' the water for those locations which will hold resting fish - not feeding fish. In my mind's eye I always graph a pool when I fish it and MEMORIZE the exact location where I strike a steelhead! This location is invaluableand remains in the same precise spot for the season and often for years unless the river channel changes. Steelhead will travel during overcast days. Knowing that steelhead will travel during cloudy and rainy days gives the steelheader the opportunity to revisit pools fished earlier in the day or, angle in pools that earlier may have been crowded with other anglers. It seems that tides play a key role in steelhead river entry from the ocean. In coastal streams I have found that on cloudy days, about four hours after the beginning of the ebb, fresh steelhead can be located in the lower reaches of most rivers. Steelhead swim and hold very close to the bottom of coastal streams! To be effective, the steelhead angler must make certain that his 'lure' (fly, bait, lure or spoon) is drifting almost on the bottom and in many situations actually bounced along the bottom. Winter steelhead do not feed when they have returned to the river because their stomach has shrunk to allow room for the growing roe sacs. Therefore the 'lure' must be presented immediately in front of them to entice them to mouth it. During high waters fish the tailout of the pool; during low waters, fish the head of the pool. When those southeasters come and rivers are in spate or flood, steelhead hold in the tailout areas of runs and pools. In these high coloured waters this location has the smoothest uninterrupted flow along the fish's sides and, has the preferred light factor steelhead require. Use the 60-20-20 approach to steelhead fishing. Spent 60% of your time fishing the pool tailouts, 20% in the pool and 20% at the head of the pool. But, when the river is low, reverse this approach and spend 60% of your angling time at the head of the pool where the fish is able to find security from ledges and rippling water. Steelhead are powerful rainbow trout able to snap a strong leader with a single shake of their head. Anglers who are not used to playing these trophies are prone to 'horse' them, that is, they will put too much tension on their tackle with the obvious result - a lost fish. Set the tension on your reel at a light setting, just enough to keep your line from tangling, and allow the fish to tire using his explosive power. Try to keep level with the fish in the pool, bow (drop your rod towards the fish) whenever the fish leaps, and play him out before you handle him in any manner. If you are going to release the fish never put your hands in his gills or drag him up on the beach where his scales and mucus will be lost. 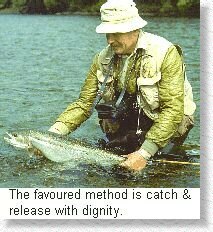 Instead, release the fish with dignity in a shallow area with wet hands - never use a glove. Steelhead are the easiest fish to hook. I have often astounded people with this statement but, most steelheaders will agree without debate. 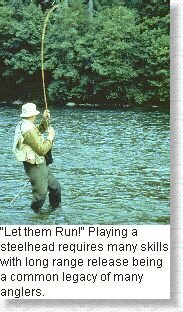 In fact, steelhead are often suicidal in their rush to take your lures. 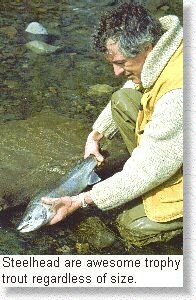 If you rest the pool after you have 'nipped' or 'rolled' a steelhead they will often take the same lure again. If you clearly identify your fish when you release it you will find that you can hook the same fish when you return to that pool. Why this Kamikaze behaviour? Simple - they are rainbow trout, Oncorhynchus mykiss! Steelheading is the angling skill closest to hunting. It is a continual search for those very few fish that annually travel the river currents in British Columbia's 1000 plus steelhead streams. To be successful, the steelheader needs to learn their environment intimately. He needs to understand water hydrology and how it will affect the movement patterns of his fish. Time spent on the river simply observing backeddies, riffles, slicks and pools is never wasted. Once a fish is found the steelheader needs to handle this special trophy trout with skill, care, and dignity. Good hunting and quick release!